Dr. Saira Ahmad grew up in Northern Virginia where she attended George Mason University to earn her Bachelor of Science degree in Biology. After watching her mother practice dentistry for over 20 years, Dr. Ahmad decided to pursue a rewarding career in dentistry for herself. Dr. Ahmad earned her Doctor of Dental Surgery Degree from Virginia Commonwealth University School of Dentistry in Richmond, Virginia. After graduation, she returned to Falls Church, Virginia to practice alongside her mother. Dr. Ahmad enjoys keeping up to date with the latest advancements in dentistry and has training in CAD/CAM technology and obtained training and certification with the Advanced Dental Implant Research and Education Center for placing dental implants. Along with private practice, she also volunteers her time to provide for patients in need with the Mission of Mercy projects held across Virginia. Dr. Ahmad holds memberships with the American Dental Association, the Virginia Dental Association, and the Northern Virginia Dental Society. Dr. Ahmad was awesome! I have a regular dentist who was unavailable, so I went to see Dr. Ahmad for my cleaning. What a great dentist. She was thorough, listened to my concerns, and made practical recommendations. I particularly liked thatshe was not "scaring" me into unnecessary procedures. Would definitely see her again. El personal completanendo profesional y muy amables. 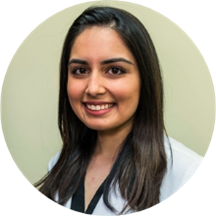 Dr. Saira Ahmad, DDS has no appointments on Zocdoc right now.